If your senior loved one is wary of electronics, perhaps some of these handy and senior-friendly gadgets will change his or her mind. 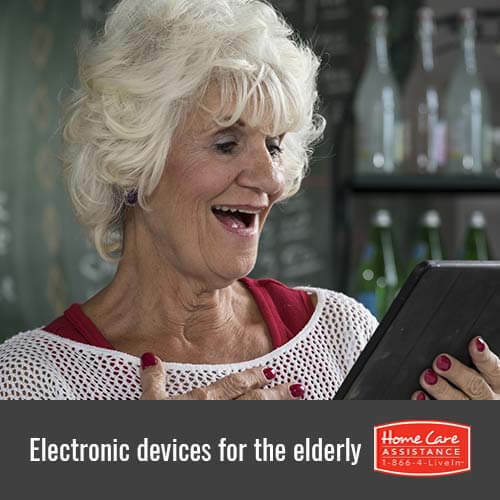 Consider purchasing one of the following electronics for your loved one that providers of senior home care in Rhode Island believe benefit the elderly. Read on to learn how. This cell phone takes the frustration out of owning and operating a mobile phone. The Jitterbug is a simple flip phone designed with large, easy-to-read buttons seniors will love. The Jitterbug looks more like the standard telephone your loved one is used to but has all the mobile capabilities of any standard cell phone. If your senior loved one would like to try something a little more modern, Jitterbug also has a smartphone line that offers many of the typical features but with seniors in mind. Plans are generally more affordable than standard phone contracts, which is a big perk for seniors on a budget. Some seniors may find it hard to get out of the house to exercise regularly. However, setting your senior loved one up with a Wii Fit will make exercising more accessible in the comfort of home. The Wii Fit offers the same fun, interactive games as the standard Wii console, but these games are geared toward exercise and fitness. One of the best things about Wii Fit is that there’s something for everyone, from active Zumba-like routines to slow, steady yoga. Your senior loved one will be more active and have a good time doing it when using the Wii Fit. These devices make phone calls easier and more enjoyable for your senior loved one. If you’re having trouble choosing a model, consider the Ameriphone Dialogue P-300. This phone allows the insertion of nine photos of family and friends on the front. Your senior loved one can call that person by simply touching his or her photograph. Additionally, the phone has a unique amplifier and a speakerphone option to make it easier for your senior loved one to hear the person he or she is speaking with. If your senior loved one is struggling to hear his or her alarm clock or is a heavy sleeper, this new electronic gadget might do the trick. Vibrating alarm clocks usually offer the option to combine vibration and sound or just use vibration to wake seniors up. The alarm clock portion generally sits on the bedside table while a small sensor goes beneath your loved one’s pillow. Gentle vibrations help your senior loved one wake up when the alarm goes off without jerking them out of a peaceful slumber. Technological advances are what drive us into the future, which seniors can still take part in. These nifty gadgets will help your loved one with everything from waking up to regular exercise without needing to rely on another person. However, some seniors require more extensive help around the house, which is why you should turn to Home Care Assistance. As a leading provider of Alzheimer’s, dementia, stroke, and Rhode Island Parkinson’s home care, we strive to help seniors adapt to illness, recuperate from injury, and enjoy their golden years at home. Schedule a free in-home consultation when you call (401) 284-0979 today and speak with a friendly Care Manager.